We’re a family owned and operated business building custom homes and neighborhoods in the Northeast Ohio area. Our developments are where luxury meets convenience and where neighbors become lifelong friends. We are honored to have worked with some of the area’s most outstanding families and appreciate the confidence, loyalty and trust we have earned over our 70+ years in the business. Whether you are a first time homebuyer or have built with us many times before, we invite you to contact us at any time to discuss building your own custom dream home in the location of your choice. We look forward to having the opportunity to visit with you and show you just what we mean by the Bob Schmitt Homes experience. You’ll be joining a pretty big family. When you build with us, you’re joining a pretty big family! We have been family owned and operated for 70+ years and through three family generations. Our family business roots mean that we pride ourselves on honesty, integrity, complete transparency, and the highest level of professionalism and customer satisfaction. Quality Materials & Superior Design. Every Bob Schmitt home offers a combination of quality materials and superior design, where every detail is meticulously crafted, and every enhancement you select is seamlessly added to create a dream home that is uniquely yours. We Build Neighborhoods & Communities. 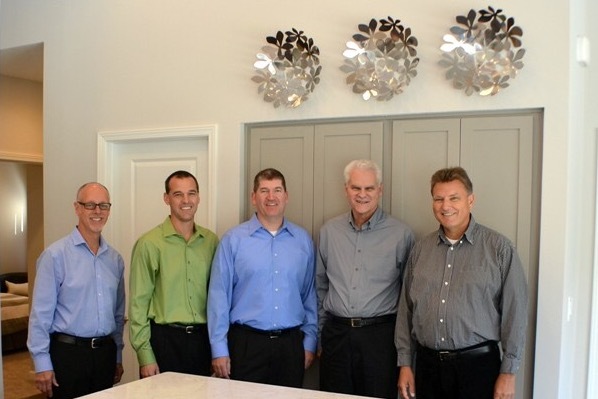 At Bob Schmitt Homes, we’re proud to say that we don’t just build homes – we build neighborhoods and communities. And because of that philosophy, we have always considered the environment of the neighborhoods we create. We consciously choose to build homes in ways that reduce environmental impact and provide energy savings, long-lasting value, and comfort. By choosing a Bob Schmitt home, you save money, you make a difference, and you maximize your quality of life.